PLEASE INCLUDE WHERE YOU ARE TRAVELLING AND HOW LONG FOR, when answering the questions, thanks. Avloclor tablets are used to help protect against malaria in certain countries. 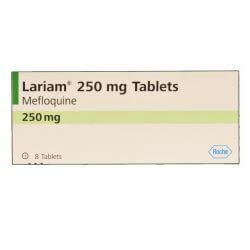 It contains the ingredient chloroquine phosphate, which belongs to a group of medicines called anti-malarials. In some areas, for maximum protection, you may have to take more than one type of tablet at the same time. Therefore, you should ask your pharmacist about the right anti-malarials for you. No medicine can be guaranteed to protect against malaria. If you have a high temperature (fever) during your visit to a malaria area, or up to a year after returning home, you should suspect malaria. Contact a doctor straight away and let him or her know that you have visited a malaria area. Always take Avloclor tablets exactly as your doctor has instructed. Start taking this medicine one week before you enter the malaria area - you must continue to take it during your stay and you must keep taking this medicine for 4 weeks after leaving the malaria area. 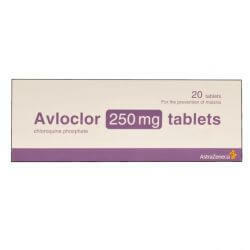 The active substance in Avloclor tablets is Chloroquine Phosphate. The other ingredients are Magnesium Stearate and Maize Starch.